Passiflora incarnata, commonly known as Maypop, Purple passionflower, True passion flower, Wild apricot, and Wild passion vine, is a fast growing perennial vine and the State Wild Flower of Tennessee. In 1569, Spanish explorers discovered passion flower in Peru. They believed the flowers symbolized Christ’s passion and indicated his approval for their exploration. In cooking, the fruit of this variety is sometimes used for jam and jellies. The fruit can be eaten out of hand and when encountered makes a very tasty snack. Historically it was a favorite of colonial settlers of the South and Native Americans. The dried, ground herb is frequently used in Europe by drinking a teaspoon of it in tea. Traditionally, the fresh or dried whole plant has been used as homeopathic medicine to treat nervous anxiety and insomnia. The chemicals in passionflower have calming, sleep inducing and muscle spasm relieving effects. Studies have shown that Passiflora can reduce symptoms of anxiety, sometimes as effectively as some prescription medications. Secondary uses of this medicine include gastrointestinal upset related to anxiety or nervousness, relieve from symptoms related to narcotic drug withdrawal, psychiatric disorders hysteria, asthma, symptoms of menopause, attention deficit-hyperactivity disorder (ADHD), palpitations, irregular heartbeat, high blood pressure, fibromyalgia, and pain relief. Passiflora is used topically on the skin for hemorrhoids, burns, pains, swellings (inflammation) and maybe rubbed into the skin to promote relaxation. 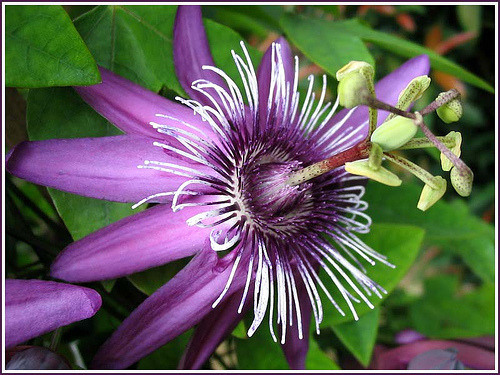 Passiflora is the passionate homeopathic remedy because to helps to promote relaxation and restfulness.